I’ve written it before; the talents and professionals working in our industry are our most important assets. Not the rooms, the public areas, your award-winning restaurant, bar, or spa, but the people are our most prized assets. The people who check-in our guests who spend hundreds of Euros a night for a room, who pick up the phone within 3 rings, who are available and of service 24/7, who work during public holidays, who serve you cold beers while you are on a terrace during your holidays, who are cooking your Christmas dinner and who clean up the toilet after it’s been used by hundreds of people. 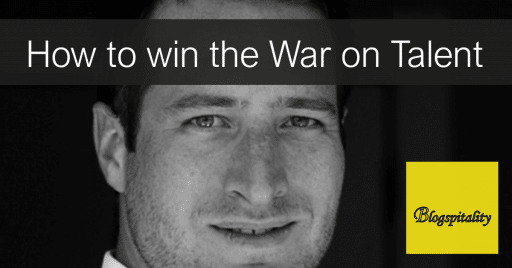 There is a War on Talent going on, also in hospitality, so in this blog you read how to win it! Because the Hospitality industry is so accessible to everybody, our staff members make or break a guest’s experience. They deliver top-notch service and they don’t do this because of the pay, but because they care, because they are hospitable and because they are passionate. The most important skills you need to work with guests aren’t your serving skills but your communication skills and having a thick skin. Wouter Verkerk also spoke about the fact that staff is never self-evident. Simply put: Guests don’t want to wait. If they place a drink order, they want the drinks right away, not in 15 minutes. If they order a souffle, you need to inform them before that it will take 20 minutes, and if they make a request for a booking, they expect an answer within 8 business hours. All quite logical right? This in times where I can place an order at a web shop today at 11am and have my new TV delivered to my home by 3pm. What I don’t understand then, when we all agree that our employees are our most important assets and that we don’t want to keep guests waiting, that we take our time in the recruitment process. What happens is that those great people apply and that they get an automated message saying “Thank you for your application. We will process your application and strive to inform you within two weeks of any next steps that we will be taking with regards to your application. Please allow for a response time of four weeks during holiday periods”. Serious, I kid you not! Two to four weeks! The War on Talent isn’t won by offering applicants the most money (which especially the Millennials crave for), nor with storytelling in commercials, nor PS4 consoles in the break area or extravert Friday parties. No, the War on Talent is won by optimizing your recruitment process and quick and clear communication towards the applicant. Long response times are the biggest turn-off for applicants in the world! If you need a bit longer to go through all resumes, or it’s so busy (congratulations!) that your dedicated recruiter (recruitment is a profession) needs a bit more time, you need to inform the candidate right away that everything has been received, that a human being is working on his application and give him or her a specific timeline, just like you do with the souffle, and stick to it! Only this way you can win the War on Talent and truly hire great talents and professionals to deliver that award-winning service and be successful as a company in the long run. My invitation to everybody involved in the hiring process is: have a good look at your recruitment process and optimize it, so that you show your future employees that you are delighted and happy with their application and want them as your new employee. That’s the only way to win the War on Talent, otherwise the war is like fighting with armed drones versus cavalry, and we all know who will win that battle. I’ve been strong armed into giving you, my dearest readers, an “Emile’s How To guide on winning the War on Talent”. Determine the message and the employer branding that you want to communicate to the workforce. Be consistent with this message and your branding and make sure that on all outings, you communicate the same message and that all material is up-to-date such as photo’s, video’s and contact details. Have a dedicated recruiter who deals with reeling in those new brilliant and talented employees. Not an HR employee who also does some recruitment. Be personal in your job advertisements (Yes, job Advertisements, not job profiles – that’s what you give them when they sign their employment agreement) and give them the handles of your social media, a picture of yourself and your direct contact details so that they can contact you with questions and remarks. Invite them to contact you before applying, trust me, it saves you time in the long run! Recruitment it’s not a waiting game, it’s a “go hunting and catch them” game! So be active, go out, advertise your jobs, hunt down the people you want to work for your company, market your jobs via socials, Hospitables.com, LinkedIn or other means. The day after you’ve received an application via your channels, contact the applicant! Either give them directly a response or tell them that you’ll get back to them as soon as possible. Do this at all time, also if your company uses automated e-mails. Most importantly; be transparent about the status of the process, tell them how long it will take and thank them! Build ambassadors! Be open and honest with them, don’t hide behind an e-mail wall. You. Are. The. Company! It’s all part of your employer branding and marketing. Guide and walk matching applicants through the whole process, tell them how the process will look like, how long, what to expect etc. Non-matching applicants “gently turn them down and thank them but be honest about the reason why you don’t see a match. Be a consultant to the candidates in the process. Help them and support them where possible, all with one goal: don’t loose them during the process! Listen to them, hear their concerns, respond to them, try to speed up the process if possible, always be one step ahead! In this way you show yourself as a great, involved company to work for and willingness to contribute to personal development of future employees. Be available, call back, respond to e-mails and always do so in an open, personal and courteous way. You’re dealing with humans and feelings, not with computers and other commodities. You. Are. The. Company! Breathe it, live it, show it!